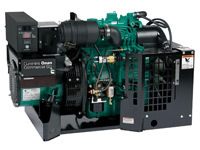 HERE IS A GREAT GUIDE FOR TROUBLESHOOTING ONAN RV GENERATORS. Here is a portion of the FAQ. because of their complexity and the need for specialized servicing tools. These include: Quiet Diesel Models HDKAJ, HDKAK and HDKAT; Microlite Model KY Spec. J and later; Camp Power Model KYD; Mobile Genset Models HGJAB and HGJAC. Refer complex servicing to a qualified generator service facility. Q. When the start switch is pressed in the coach or at the generator, nothing happens. What could be the problem? control fuse first. If the lights work, use the Troubleshooting Guide to isolate the problem. Q. Why does my generator crank over normally but not start? sprayed into the air intake, it is a fuel problem. The ignition can be checked by removing and grounding a spark plug. Refer to the “Getting the Engine Running” section of the Troubleshooting Guide to isolate the problem. Q. Why does my generator start and then shut down as soon as the start switch is released? during troubleshooting. Use the Troubleshooting Guide to isolate the problem. Q. The start switch works at the generator but not from inside of the coach. What is the problem? the control at the generator. Check remote switch and wiring. Q. The start switch works from inside of the coach but not at the generator. What is the problem? A. The start switch on the control board or control panel is defective. Replace the switch or control board, as applicable. Q. Why does my generator run rough and/or smoke, even after it is warmed up? adjusted carburetor (too rich), or a sticking carburetor float that allows excess fuel to enter the carburetor bowl. Rough running can also be caused by fouled spark plugs.